Not in the property management industry? See other use cases. You know how frustrating collections can be. If you manage your own property, bounced checks and late payments can be a frequent headache. And if you manage property for someone else, there’s the added burden of having to explain past-due collections to your client, the property owner. 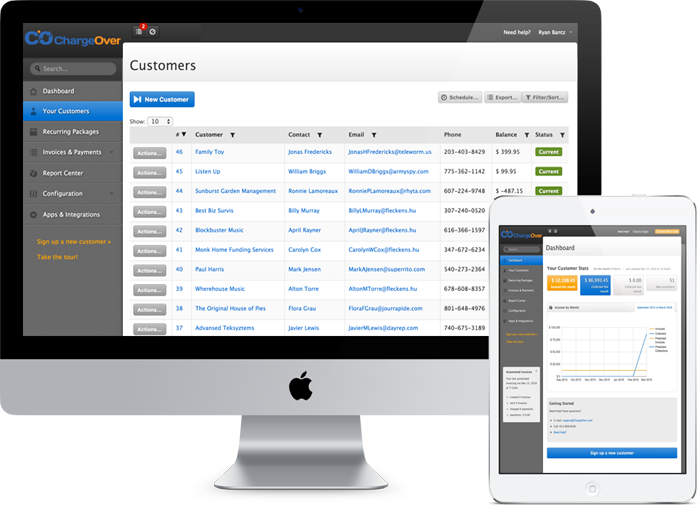 But what if there was an easier, better, more streamlined way to manage rent collection at your business? The property management business has no shortage of challenges. From property upkeep and maintenance to legal liabilities, you’ve got a lot on your plate—and that’s before you even factor in the #1 headache for property managers: Collections. Having to “chase” after tenants for payments. Tenants demanding extra time to pay. Landlords/clients demanding more consistent collection rates. While the advent of online billing has made collections easier, the fact remains that many tenants still don’t pay on time. What’s needed is an easier, streamlined, automated way to manage collections. That’s why we created ChargeOver—simple software that automates the entire billing and invoicing process. Less time spent manually chasing rent. Less time and money spent on spreadsheets and financial data. Better relationships with tenants and landlords. ChargeOver’s most powerful benefit for property managers is the ability to automate monthly payments. It’s as easy as adding a tenant, specifying payment terms, and letting us handle the rest at the end of each month. Tenant’s credit cards are billed automatically, dramatically minimizing the time you spend actively trying to collect. This leaves you with more free time to focus on other pressing concerns at your business. Automated payments maximize collections by charging the tenant’s credit card on a set schedule. Instead of actively seeking payment from tenants, you bill automatically at a predetermined time each month, similar to how the phone company or bank would. This creates a simpler, more streamlined experience for both you and the tenant, and reduces missed payments significantly. Missed payments aren’t the only headache you have to worry about. Even when you collect on time, there’s still the matter of downloading, recording and processing the invoice data. Once again, we have you covered. ChargeOver creates invoices for you automatically, and downloads payment data to your accounting software the minute they’re paid. In the property management business, turnover is a fact of life. Tenants move on, and when that happens, you need to fill the vacancy as quickly as possible. ChargeOver streamlines the process of adding new tenants with a simple backend interface that lets you set up payment plans in seconds. From the minute a new tenant says the word ‘go,’ you can set up their payment plan and have them in the monthly payment cycle. And, ChargeOver lets you specify payment plans any way you want. If you manage multiple properties with different unit sizes and prices, you can create custom payment plans for each one and bill your tenants as appropriate. We understand that managing property is a hectic business. So ,we made it super easy to get started with ChargeOver. There are no contracts to sign, and you are under no obligation. Just create your ChargeOver account, and start using our valuable billing features in minutes. We know you’ll probably want to test-drive ChargeOver for a while to see how it can benefit your business. That is why your first 14 days are free. Create your ChargeOver account now.